I'm pumped up about three books that I bought recently. Sorry for the lame pictures.... I don't have a scanner. These aren't super high-grade like many of the museum pieces that I've seen here recently on the boards, but for what they are, Farrell pre-code horror, the condition is stellar. They all belonged to a single collector who spent many, many years putting togeter an Ajax/Farrell collection. One reason I am very excited to have these books is that they are in very similar condition with vibrant colors and good page quality. Each has a cover crease, but not much in the way of edge tears, chipping or chunks. It's very difficult to put together a nice run, and unless you're a multi-millionaire, you have to go for books that are less than NM to do so. And that means finding books with similar defects and appeal. The collector of these books did an admirable job. 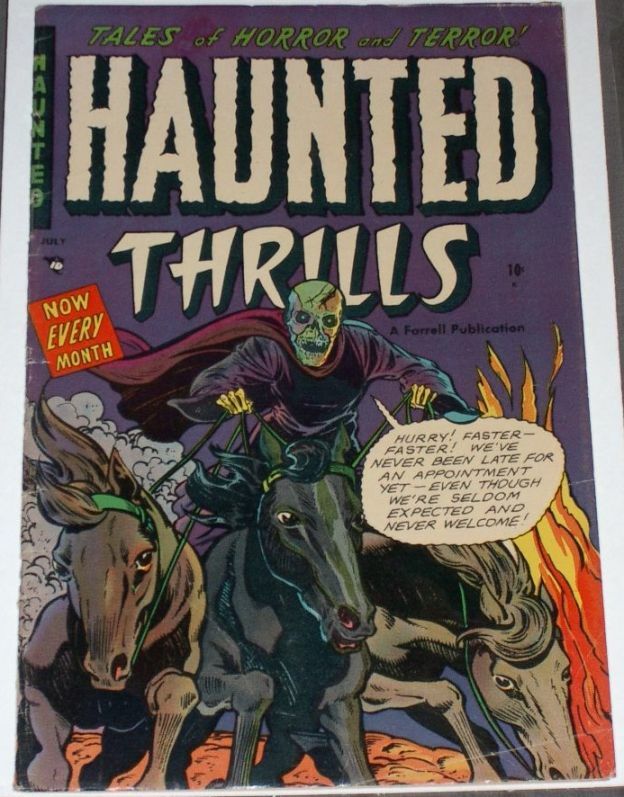 And here's Haunted Thrills #10. Even though I typically don't like word balloons on covers, this one was too good to pass up. I just fell in love with that eggplant purple cover background... Farrell had some great colorist(s)... The interiors were uniquely colored as well. Well first off, Paul, those covers are just beautiful. The books really look good - have great color and look pretty danged clean, rich and glossy! Subject matter? Well, I guess if you like precode horror they may appeal to SOME people. OK - seriously, those really are classic precode, especially the first two covers. And it is most generous to show some of those pages as well! Really enjoying these! You may want to post them, though, in the Have A Cigar - Golden Age Only thread here. It is locked at the top and your sweet books will be seen for as long as you keep the links up! Thanks, POV. I have to be honest.... I had other targets in mind in pre-code horror books when I first saw these. Seeing them up close made me realize that I had to have them for my collection. There was something about not only the condition of the books, but the production values, quality covers, and cover coloring that swayed me. Bravo! Simply awesome books! I don't think the Iger shop gets enough respect. A/F put out some really kooky/kool pre-code horror books. Gotta luv 'em! I had other targets in mind in pre-code horror books when I first saw these. Seeing them up close made me realize that I had to have them for my collection. I have to say it is great to see yet another precode horror collector here! We are slowly gaining in world dominion! Have you seen my pre-code horror checklist? It is my take on all of the precode horror books including title, publisher, issue numbers, dates and some notes. You can open it in your browser (it is in CSV format), copy it and paste it right into a spreadsheet. Hope you think it is useful. Was fun to com;pile and I opcassionally update it. 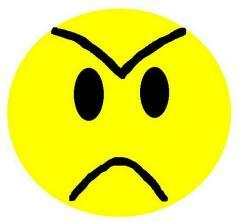 If you see something that should be added or removed please let me know! Thanks, Keith! By the way, that is a killer copy of Witches Tales #25. I need a copy like that for my collection. Wow, great Ajax books! Very nice going indeed. I love that apocalyptic horseman cover, very Pat Roberston. And Pov, may I say that your pre-code checklist is invaluable, wonderful stuff? I made a printout, I'm sure I'll use it often as I try to capture 9.8's of every book on there, hahaha! I didn't see the Bobby Benson horror cover on your list? 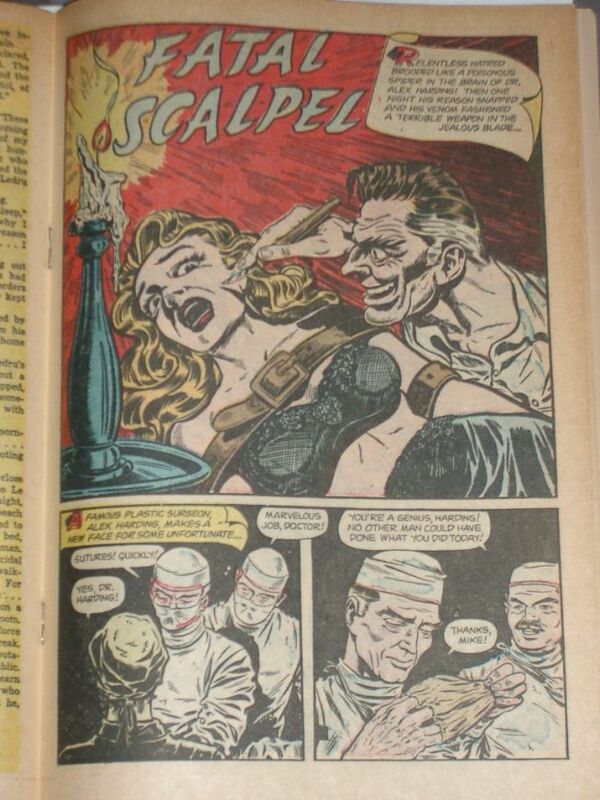 I can't remember the issue # offhand, but it's the one with the mad scientist and the hanging heads on the wall. I know BB is a cheeze western title, but it's kinda a classic campy horror cover, doncha think? Love that cover on issue #10. Truth be told, there are a lot of precode horror covers that are not there. Basically I tried to make a list that only includes 100% precode horror as far as content goes as well. 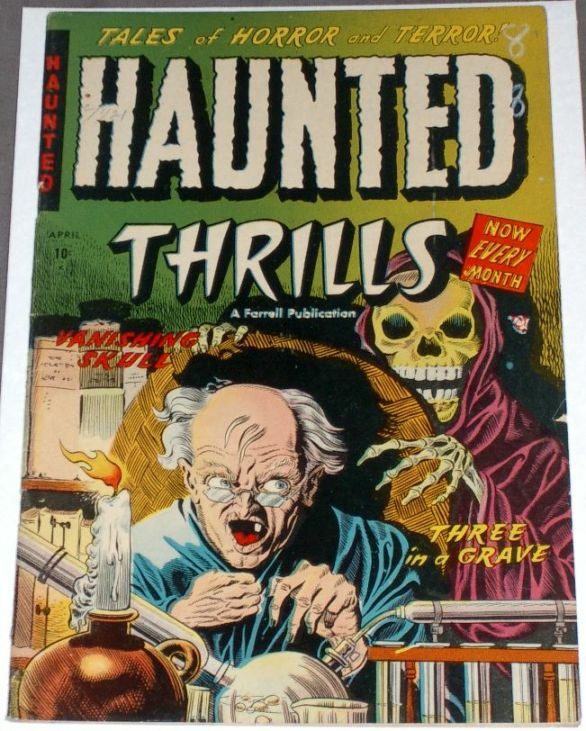 Covers like that Bobby Benson 14 or ME 27 (Ghost Rider 1) etc - heck - even some of the 40's GA books that had horror covers I didn't include. They are interesting to say the least. But I had to make some criteria for where to STOP! Now the bulk of my list comes from TALES TOO TERRIBLE TO TELL - hope you know about it. If you don;t just say so and will direct you to the best $25 you ever spent on precode horror! I'm definitely going to get the TTTTT set.... thanks for the recommendation a while back. Right.... early L.B. Cole covers come to mind.... 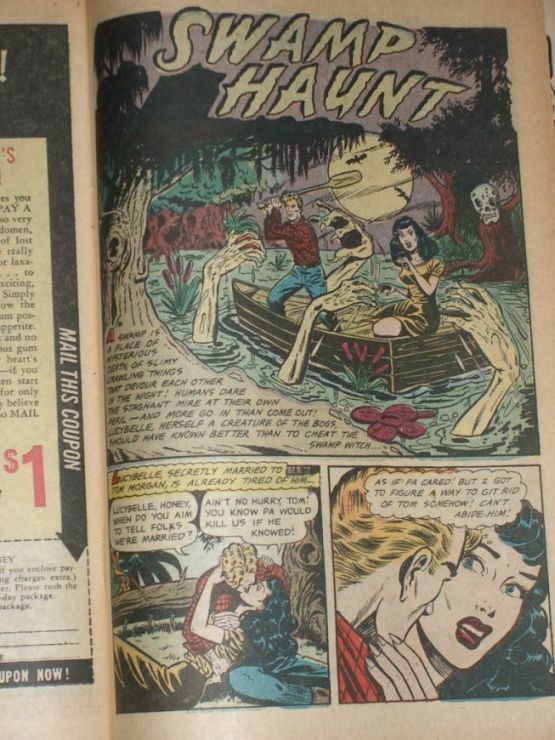 Suspense Comics #8-#11, Mask Comics #1-2, etc. they had great horror covers but usually had crime-related interiors. You got it. And a lot of the sci-fi books from the day, including the Avon 1-shots and EC titles, often had horrific covers but were really more sci-fi than horror content. 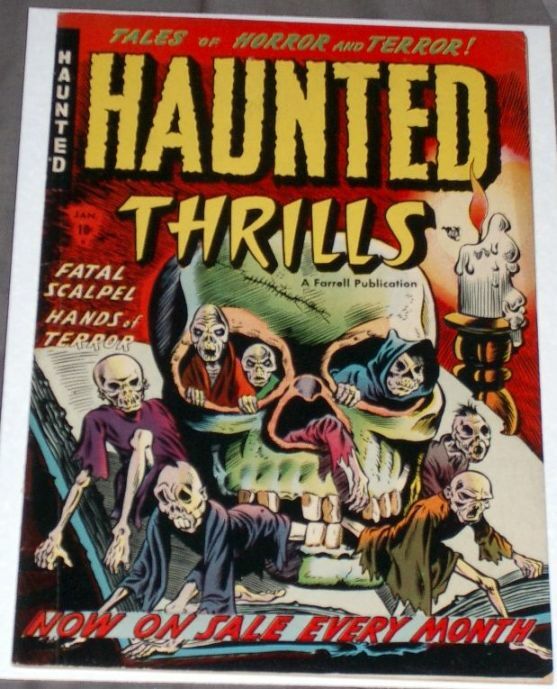 Between that Skull cover and that "Fatal Scalpel" splash, I might have to add HT#5 to my want list. Nice books by the way. Keith, some of the non-reprint Star interiors are great. I really like the work that Jay Disbrow did for those titles. Even if you don't like the interiors, so many of those Cole covers are just unbelievable. rjpb, I find that the Farrell books are pretty tough to find in grades higher than 6.0 - 7.0 or so. I know Vinny has a HT #5 pedigree up for sale, but you might as well hand over your next mortage payment to him if you want it. I've seen that #5 on Metro's site, it's like $1600 or something like that! I think my fav pre-codes are Black Magic and Dark Mysteries. Black Magic is an especially underrated title, I feel, because it got so crappy when it continued post-code. I love how the Black Magic covers are loaded with dialogue balloons. You get a little story on every cover!